Robert Stack - "Dr. Donovan MacLeod"
Polly Bergen - "Lorna Melford"
Diane McBain - "Alison Horne"
Van Williams - "Dr. Larry Denning"
Constance Ford - "Nurse Bracken"
Herbert Marshall - "Dr. Jubal Harrington"
Joan stars as the institution's head nurse, who believes in more old-fashioned approaches to ​​the handling of the patients via intimidation and control. Robert Stack portrays the institution's newest psychologist experimenting with modern forms of therapy he deems more effective, including group talk among a selected number of patients he refers to as "boarderline cases". ​ In January 1961, director and producer Hall Bartlett via his production company, signed a production and release agreement for the film with United Artists. Shortly afterword ​hired Robert and Eileen Bassing to write the film's screenplay, however, their script was ultimately not used. Bartlett's original choices for the leading roles of Dr. MacLeod (portrayed by Stack) and Nurse Terry (portrayed by Joan) was Kirk Douglas and Lana Turner with a filming date of August 14th, 1961. ​​​Bartlett first contacted Joan with regarding the film in June 1961. ​Filming began (with the final product's cast) on June 1st, 1962 at the Desilu Studio in Los Angeles, California. Editing began in September 1962. ​In early October, composer Elmer Bernstein was hired to score the film​​. ​Several of Joan's scenes were cut from the final film. This is the final film in which Joan appears to receive an Academy Award nomination. On April 15th, 1963, a special screening of the film was held at the Lytton Center in Hollywood, California. ​The screening was hosted by Joan, Robert Stack and Janis Paige. ​​ On August 9th, 1963, a screening of the film was held at the Director's Guild Theatre. ​The screening was sponsored by the Lamp Minders, a non-profit organization dedicated to raising funds for the benefit of the Los Angeles Psychiatric Service. In August 1963, 24 screenings was set for public and social groups. Including press and disk jockeys, The General Federation of Women's Clubs and the advisory committee of the Los Angeles County Medical Board. August 21st, 1963 The film was released nationally. 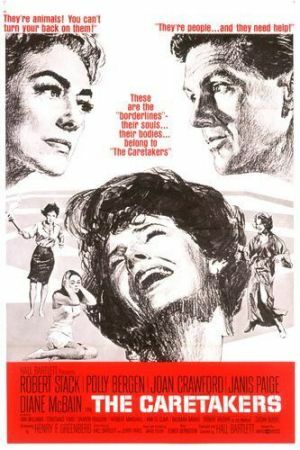 September 18th, 1963: The film opened in 50 theaters in New York ​​following a strong-grossing three-week run on the distributor's "premiere showcase" plan. ​ $32,500.00 (Second week - August 28th, 1963) Astor Theater, Murray Hill Theater - New York, New York. $18,000.00 (Third week - September 4th, 1963) Astor Theater - New York​​​, New York. $30,000.00 (​​Third week - September 11th, 1963) Orpheum Theater - New York. $4,000.00 (Third week - September 11th, 1963) Mission Drive-in​ - San Antonio, Texas. $6,900.00 (Second week - September 18th,​​ 1963) Laurel Hurst Theater - Portland, Oregon. $5,000.00 (2-day run - October 16th, 1963) Orpheum Theater - Minneapolis, Minnesota. Golden Globe nomination for "Best Motion Picture - Drama"